2014 4-Coin Silver Niue The Avengers Proof Set. With a limited mintage of only 3,500 sets, APMEX is your direct source for these new and exciting 4 coin sets! 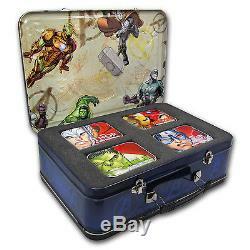 Each set includes all your favorite Avengers: Hulk, Thor, Iron Man and Captain America. All four coins in this set are. 999 fine Silver, with colorful images of these fantastic heroes! 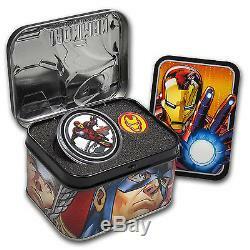 Each coin comes in a limited edition embossed collectible character tin that showcases the featured Avenger. Also included with each coin is a lifelike, four-color character bio card printed in state-of-the-art 3-D, specially designed label pin, as well as a certificate of authenticity diecut from stainless steel! 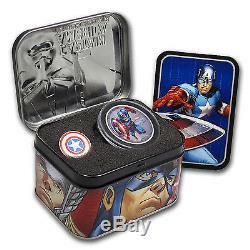 Your complete set of four coins and the collectible character tins are kept safe in a limited edition Avengers oversize "lunchbox"! 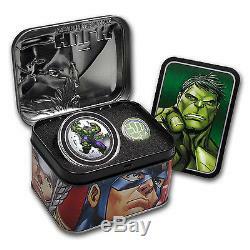 This beautifully designed and elegantly crafted four-coin set would be the perfect addition to any Marvel collection or would make a great gift for the superhero fan in your life! Add this exclusive set to your cart today! APMEX stands behind every product it sells with a satisfaction guarantee. As one of the world's largest online retailers of Gold, Silver, Platinum and Palladium, APMEX is a trusted source for purchasing Precious Metals. For more than 10 years, we have been helping individuals and families in protecting their hard-earned assets and increasing their wealth by investing in physical Gold, Silver, Platinum and Palladium. APMEX provides timely information and education about the Precious Metals market and offers a vast selection of premium quality products at highly competitive prices with best-in-class service. Read more about APMEX here. Each package is fully insured. There are no exceptions to this rule. The UPS Store, or similar third party drop off locations. If you do not receive the package directly from the common carrier, you agree to take all reasonable actions to assist in recovery of the package, including but not limited to filling out reports (and/or police reports) and providing all information needed or that may be requested to assist in recovery of the package. If we determine the package is lost or damaged, we file a claim. Failure to fully cooperate will jeopardize coverage that may be provided to you. For approved exchanges, you must follow all instructions provided by Customer Service, including carefully packaging the Product. We are available Monday through Friday from 7 a. Central Time, closed Saturday and Sunday. McGee Avenue Oklahoma City, OK 73102. We will never willfully disclose individually identifiable information about our customers to any third party, except in the limited circumstances permitted by this policy. APMEX does not sell, rent, or loan any personally identifiable information regarding its customers to any third party. Any information you give us is held with the utmost care and security, and will not be used in ways to which you have not consented. The term "Bullion" is used to describe (1) Gold, Silver, Platinum or Palladium Coin(s) which closely follow spot prices and have little or no Numismatic value (such as restrikes); and (2) the form in which metal is shaped such as bars, ingots or wafers. The term "Coin(s)" means a stamped piece of metal of a known weight and fineness issued for commerce by a sovereign government. The term "Fair Market Value" means the Fair Market Value of the Product as determined by APMEX, in its reasonable discretion, as of 5:00 p. The term "Numismatic Coin(s)" means a Coin, the price of which depends more in its (their) rarity, condition, dates, and mint marks than on their gold or silver content, if any. The term "Precious Metal" means Gold, Silver and Platinum along with the Platinum group of elements: rhodium, osmium, ruthenium, Palladium and iridium. Precious Metals are characteristically lustrous, ductile, rare and nonreactive. A Product may include, without limitation, Bullion; a Coin, whether Numismatic, Semi-Numismatic or not a Precious Metal; and/or supplies. The term "Semi-Numismatic" means a Coin that has both Bullion and Numismatic value. No other relationship, including, without limitation, any agent-principal relationship, any employee-employer relationship, any franchisee-franchisor relationship, any joint venture relationship or any partnership relationship, between APMEX and you exists. These T&C are intended to be enforceable to the fullest extent permitted by applicable law. If any term of these T&C is held to be unenforceable for any reason, such unenforceability shall not affect the other terms of these T&C, and the term that would otherwise be unenforceable shall be enforced to the fullest extent that it would be enforceable. APMEX may amend these T&C at any time by posting the amended terms on the website, and such amendments shall become effective immediately. If you become aware that you may be required to make any disclosure of such information, including, without limitation, as a result of the receipt of a subpoena or other compulsory process, you shall promptly notify, in writing, APMEX and you shall cooperate, in good faith, with APMEX in obtaining a protective order or other appropriate relief, if any, with respect to such disclosure. This listing is currently undergoing maintenance, we apologise for any inconvenience caused. 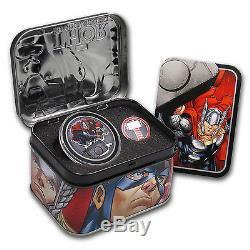 The item "2014 4-Coin Silver Niue The Avengers Proof Set" is in sale since Thursday, November 13, 2014. This item is in the category "Coins & Paper Money\Bullion\Silver\Coins".